Verizon’s agreement with T-Mobile earlier this week for a swap of AWS holdings to give both sides more contiguous spectrum within the AWS-1 band, raises a host of interesting possibilities for future transactions in the wireless space. UBS is speculating today that AT&T will dispose of its remaining AWS holdings, but it seems more plausible that AT&T could actually swap its remaining AWS spectrum (most of which is in the A-block or C-block and would naturally pair up with Verizon’s holdings in Los Angeles, Chicago, Dallas, Miami, Minneapolis and numerous other markets) for Verizon’s 700MHz B block holdings. Although AT&T has more AWS spectrum (~1B MHzPOPs) than Verizon has in the 700MHz B block (just under 600M MHzPOPs), as I’ve noted before Verizon overpaid in the 700MHz auction to prevent AT&T from buying all of the B block, and so Verizon spent $2B on its B block spectrum whereas AT&T’s remaining AWS holdings only cost between $500M and $600M (and using the SpectrumCo transaction as a benchmark, would only be valued at around $700M today). By exiting its 700MHz B block holdings via a swap, Verizon would avoid having to take a loss on this expensive spectrum purchase, but it would be interesting to see whether money actually changed hands in such a transaction with AT&T (given that both companies have an incentive to talk up the value of spectrum, not least to make spectrum acquisitions more expensive for their rivals). Of course, if such a swap proves infeasible (perhaps because of the significant discrepancy in price per MHzPOP) then it still seems unlikely that AT&T would announce a sale of AWS spectrum without some quid pro quo acquisition, either of Verizon’s B block, or more likely in conjunction with the purchase of DISH’s holdings (after terrestrial use of the AWS-4 block is approved by the FCC). In either case, I assume that a deal wouldn’t come until after the November 2012 presidential election. Looking further afield, it now also seems less certain that the FCC will free up the PCS H block (which would require DISH’s uplinks to move up by 5MHz to 2005-2025MHz) when it gives DISH the go-ahead for terrestrial use of the DBSD/TerreStar AWS-4 spectrum band. As a result, Sprint might also find itself looking at swaps with smaller players such as MetroPCS and Leap to gain wider channels for its PCS G block LTE network (by using existing F block spectrum). In those circumstances, Leap and MetroPCS could potentially be paid money for a spectrum swap without necessarily giving up any capacity, assuming that Sprint gave them alternative PCS holdings in the lower part of the band instead, and this could prove interesting given the financial pressures that smaller carriers are under. That pretty much sums up the situation with inflight cellphone calls in the rest of the world, after OnAir’s CEO indicated that only 10% of OnAir’s inflight GSM traffic is now coming from voice calls. Just how disastrous a statistic that is can be discerned from the fact that Inmarsat’s total wholesale aero passenger connectivity revenue is only around $2M per year, from 160 planes equipped with cellular connectivity, or around $12K per plane per year (in fact the number might even be lower if Inmarsat is including the far larger number of long haul planes equipped with traditional seatback phones in its $2M total). 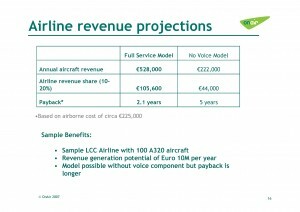 Grossing up to retail revenues, that means passengers are spending perhaps $30K to $40K per plane per year on cellular services, and so if only 10% of OnAir’s “traffic” (which I assume is measured in revenue terms) is derived from voice calls, then that is about $10 per plane per day in voice usage. Put another way, I estimate that on average there may be as few as 2 voice calls per plane per day! 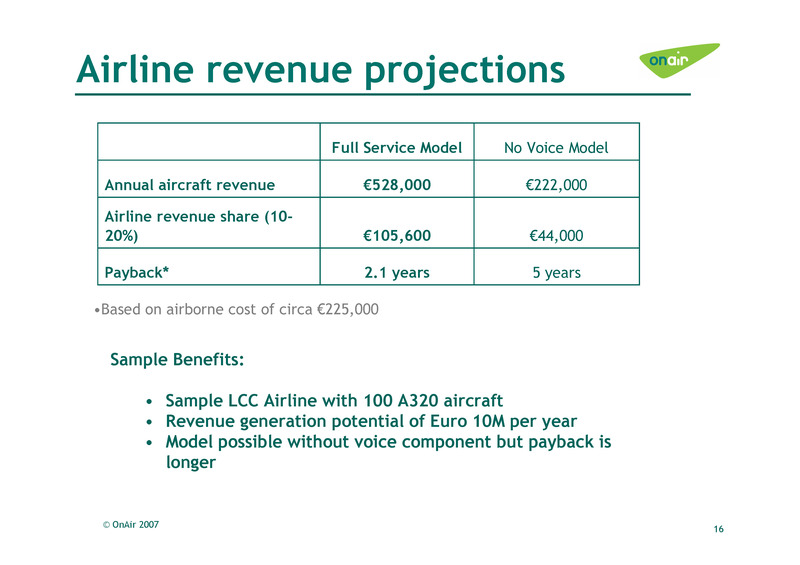 For (a truly scary) comparison, take a look at OnAir’s estimates back in 2007, that Ryanair passengers would spend EUR300K per plane per year on voice calling, or 100 times more than the current level of usage. Of course that shouldn’t really be a surprise, because the original providers of inflight phones in the US (Verizon Airfone and Claircom) both went out of business and Inmarsat’s revenues from seatback phones were about 2% of their original projection in the early 1990s. More recently, Ryanair also stopped providing inflight cellular services. Obviously the lack of privacy and the level of background noise make it pretty hard to conduct business on a cellphone call inflight, while the cost has generally been prohibitive for leisure users, and neither of those factors has changed in any meaningful way with the introduction of cellphone instead of seatback connectivity. As a result, its no wonder that business travelers much prefer email and SMS to voice calls, and some airlines have even decided to ban voice calling themselves, despite it being legal outside the US. It therefore seems pretty ironic that we’ve had letterwriting campaigns to the FAA and FCC, a ban proposed in Congress and even a lobbying group set up by OnAir and AeroMobile, trying to argue that voice calls on planes are a bad or a good thing (depending on your point of view), when the reality is that almost no-one actually wants to do it anyway. However, just as with the title of this article, once people become convinced that there is no middle ground to the debate, logic tends to fly out of the window. In those circumstances, its no wonder that members of Congress are eager to get involved. UPDATE (9/5): The FAA’s own consultation document on legalizing cellphone use onboard aircraft has now been published and gives some interesting specifics on the usage levels seen in other countries. In particular, the Brazilian regulator indicated that TAM was only seeing about 0.3 voice calls per flight leg, and the consensus of most respondent countries was “that there was relatively low use of cell phone voice communication on airplanes”.